Green peas and paneer pulao is delicious and appetizing not only to the palate but also for the presentation. Add few roasted cashews to the pulao that will make this simple dish special for the parties and the special occasions. The addition of the paneer makes this pulao a balanced one meal vegetarian dish. It is great for Sunday’s meal when you do not want to cook anything big. You could prepare this dish as it is or add any other vegetables and garnish with sliced hard boiled eggs. Serve this mutar paneer pulao with yogurt, coriander chutney or choice of pickle. 1. Wash the rice and soak it for 15 minutes. 2. Slice the paneer in ½” Long and ½” wide and ½” thick cubes or as you prefer. 3. Heat 1 tablespoon of oil in a non stick frying pan, place the paneer cubes in the pan and sauté, one minute each side or until paneer become light brown. Once all the paneer fried keep it aside. 4. In a sauce pan heat 2 tablespoons of oil, add chopped onions and sauté them for 5 to 6 minutes on medium high heat or until they become light brown. Add cumin seeds and asafetida and fry for 1 minute, or until cumin seeds become brown, add bay leaves, if you are going to add cinnamon stick and black cardamoms add now and fry for few seconds turn the heat to low. 5. Wash and drain the rice, add to the browned onions and sauté for about 2 to 3 minutes, while being careful not to break the rice grains. 6. Add green peas, fried paneer, salt, turmeric powder and 2 cups of water, and mix, turn the heat to high, and keep the saucepan uncovered, in about 7 to 8 minutes water will start boiling, turn the heat down to medium. Let the water reduce slightly below the rice level then lower the heat to low and place the cover over saucepan. 7. Let the rice cook on low heat for 5 to 6 minutes then turn the heat off. 8. Leave the sauce pan covered and let the rice rest for at least 10 to 15 minutes before serving. 9. Fluff the rice gently with a fork before serving. 1. If you like to add whole black pepper, cloves, cinnamon and black whole cardamoms, but do not like to eat them, then you can take all the spice place them in a small cheese cloth, tie the cloth and place this ball of cloth in boiling water while rice are cooking, after cooking rice take the ball of cloth out, or you could use tea infuser, place all the spices in the tea infuser and place it in the boiling water with the rice. 2. Any other vegetables or spices could be added to the pulao. 4. Sautéing the rice in ghee or oil seals the starch in the grains, and prevents it from becoming soggy and separates each grain. 5. Fried or sautéed cashew nuts could be added to pulao while cooking. 6. 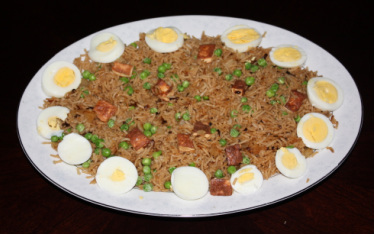 Garnish the pulao with sliced hard boiled eggs. 7. Cook the pulao with only paneer.